10 easy folk dances curated and presented by Christoph Maubach and Bill Vryens. Graded dances suitable for students from beginning to upper primary. 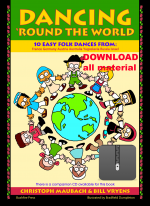 10 easy folk dances from France, Germany, Austria, Yugoslavia, Russia and Israel collected and presented by the legendary Christoph Maubach and Bill Vryens. 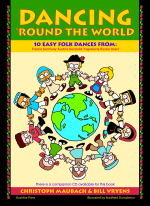 There are three ways to purchase Dancin’ Round the World: as a physical book, an immediate download (individual songs or entire resource), or via the iBooks store. The choice is yours! 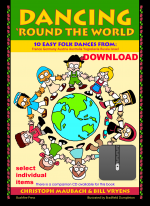 This resource provides a book and CD including full instructions and music for 10 folk dances. Original music tracks recorded at Melba Hall, Melbourne University. Recorded by Lesley Greythorn. Musicians: Cristoph Maubach, Rosalie Hastwell, Joanne Parsons, Bill Vryens, Julia Taranto, Talea Gillard, Merelyn Neale and Davina Denman.